This is not a legitimate company. The address they are using is for the Masonic Lodge and we are the only occupants of this address. They have no contact information listed on their website at all and they are not shipping out the products that people have paid for. Thanks for your message. Let us contact them for their side of explanation and we’ll act on this listing accordingly. No result on enquiries for address or legitimacy after 5 months? Please update on responses, svp. We’ve updated the latest notice on this listing. Thanks for reminding us about the same. If Peter had looked on the day of posting he would have seen the corrections applied immediately in talking with Kayla in January. It had Brisbane as the city with the google maps placing the centre point for Brisbane in the Masonic lodge vicinity. It is a frequent occurrence for them – ask Kayla to verify. Instead of taking the suburb field for the map, it took the city field. It was all immediately rectified in the website administration, phone number was there and the field that triggered that google map location adjusted. Kayla at Masonic lodge can confirm. The case referred to by her of non-delivery was a school address during Christmas/January holidays. You will find that the person received their product safe and sound. Fully legitimate operations that were assimilated into a another bullion entity last week, so non-compete conditions enacted. 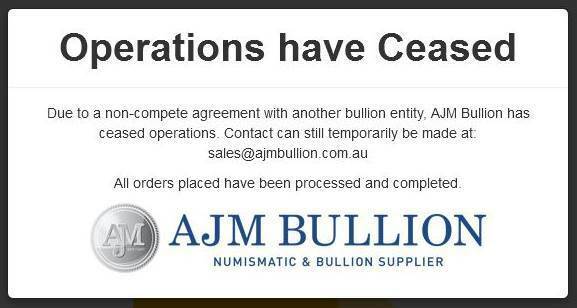 The bullion organisation will register and submit all relevant documents of legitimacy requested to the Australian Coin Dealers association, with a shopfront and office being opened.